Certain foods and other substances are notorious for staining teeth. These include tobacco, coffee, red wine, and even tomato sauce. But now you can enjoy these things and others without having to worry about hiding your smile due to stained teeth. Here are five simple ways to avoid staining your teeth while eating anything you like. Being aware of the stain potential of the foods you eat can help you limit their intake to practical levels. For example, if you know coffee can leave your teeth brown and unsightly, limit yourself to just a cup or two per day. If you smoke or use chewing tobacco, try to cut down or even stop its uses. Not only will it improve your smile, but it will make you feel healthier and more confident as well. Most substances that stain teeth only work if they are allowed to sit on the surface of the tooth enamel for a prolonged period of time. Brushing your teeth and rinsing your mouth after consuming these substances can limit their ability to stain teeth. Many kinds of toothpaste and other oral health products now include tooth-whitening ingredients that can brighten your smile. Use tooth-whitening toothpaste or ask your dentists about treatments you can use at home to remove stains and improve the whiteness of your teeth. The more you smile in the mirror, the more aware you will be of the brightness of your smile. Smiling in the mirror daily can help identify tooth stains before they take hold. When you notice the slightest discoloration, take steps to eliminate it with tooth-whitening toothpaste or other measures. The most reliable way to monitor the brightness of your smile is to trust the professionals. Your dentist can help you watch for and eliminate tooth stains before they become noticeable. 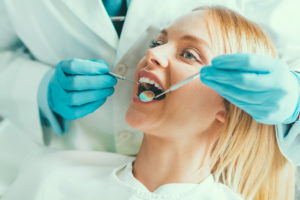 Regular teeth cleaning, checkups, and other dental services can not only improve your smile but also keep your teeth healthy and dependable for many years to come.